"More leaves from the journal of a life in the Highlands" was compiled from the Queen's diaries and published in 1884. 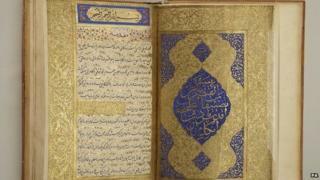 A Persian translation, covered in dazzling gold illumination, was created the following year and presented to the monarch. It is going on display at the Queen's Gallery in Edinburgh later this month. Queen Victoria's book, in which she reveals her thoughts on surviving a carriage accident and tasting haggis for the first time, became an instant hit with readers. It covered the period from 1862 to 1882 and followed an earlier publication covering her life from 1848 to 1861. The later book, beginning less than a year after her husband Prince Albert's death, reflects the queen's grief but also how her "sad and suffering heart was soothed and cheered by the excursions and incidents it recounts". After Albert's death, the queen spent up to four months a year at Balmoral, her "dear paradise in the Highlands", recording her appreciation of the natural beauty of the landscape. Her diary entries include numerous anecdotes, from opening the Aberdeen waterworks in 1866 to visiting Mary Queen of Scots' apartments at the Palace of Holyroodhouse in Edinburgh. In 1865 she travelled to Dunkeld in Perthshire to stay with the dowager duchess of Atholl. She wrote that she was served "several Scotch dishes, two soups and the celebrated haggis which I tried last night and really liked very much". One of the most dramatic incidents in the book is the Queen's account of a carriage accident on the way back from Alltnaguibhsaich in 1863 when the vehicle overturned and she fell face-down into the ground. She said: "I had time to reflect on whether we should be killed or not, and thought there were still things I had not settled and wanted to do." The Persian manuscript was created for presenting to the queen by Kilmarnock-born Major-General Sir Robert J Murdoch Smith, director of the Edinburgh Museum of Science and Art. That handwritten translation will go on display in Scotland for the first time as part of a new Royal Collection exhibition looking at gold. Curator Lauren Porter, of the Royal Collection Trust, said: "This striking translation of an extremely popular 19th-century title contains some beautiful examples of calligraphy and highly-intricate gilding. "Given Queen Victoria's enduring relationship with Scotland, it is fitting that the book should be displayed at the Queen's Gallery, Edinburgh." The exhibition will be at the gallery from 27 March to 26 July.